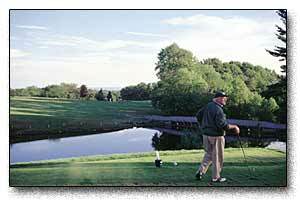 Also visit GolfPocono.com for the very latest package deals ! Resort - Inn is on the historic register. Recently updated baths, carpet, and rooms. Thousands of acres to roam and plenty of activities for the kids and spouse. A classic civil upscale resort. Comfortable and classy. Perfect for quiet time to reflect, walk through the wood and by the stream, or ride horses onsite. Onsite fly fishing. Golf - All the golf you want to play plus club storage. Cart - One half cart per person for 18 holes per night stay. Meals - Three a day with lunch at the Golf Lodge if you prefer. 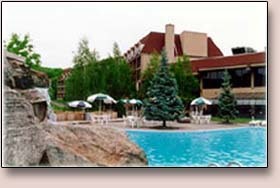 Resort -A mountainside hotel that thinks it's a resort. (That's a good thing!) Indoor/outdoor pool complex, game room, small fitness center, whirlpool in the pool area. Restaurant on the property. Adjacent to Camelback ski resort/Camelbeach waterpark. Golf -Your choice of one of the Seven 18-hole Championship Courses. Course - Seven different courses to choose from: Country Club of the Poconos, Glenbrook Country Club, Mountain Laurel Golf Course, Pocono Farms Country Club, Water Gap Country Club, Wild Pines / Pinecrest Golf Course, Southmoore Golf Course. Rates believed to be accurate but must be confirmed upon booking reservation.